Dagapela residents are in short of clean drinking water for many years now. With no proper water source, people are forced to fetch water from a pond nearby, which people say is not safe for drinking. Around 40 shopkeepers in Dagapela temporary town fetch drinking water from a small nearby pond. Residents however say the water from the pond is dirty and unsafe for drinking. But being the only water source in the locality, people say they have no option but to consume the water. A town resident Baghi Maya Dhal said both children and adult often fall sick because of unhygienic water. “During election, party candidates promise to solve our water problem. But now we don’t hear them talking about our water problem”. To add to the problem, another resident Nado says water from the pond is not sufficient. Nado said the government has not helped them in addressing their problem. “Some people bought water pipes to get water from nearby forest on their own”. The Tsenda-Gang Gewog Administration however says they did what they could to address the problem. 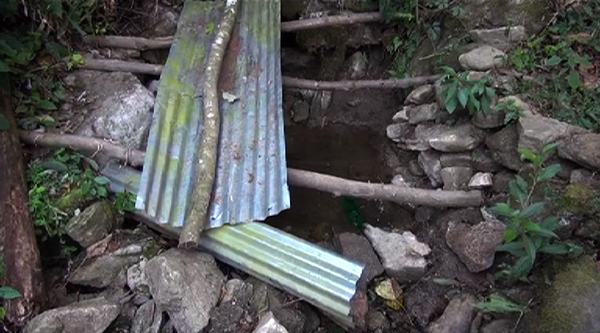 According to Tsenda-Gang Gup Bal Bahadur Rana, the gewog constructed a water tap but is now out of funds to do more. The business community however is not alone facing the problem. Residents residing around the town area are also going through the same problem. People use small containers to store water at the source, in absence of a proper reservoir. People however are worried of water source drying up. “We cannot give funds from the Gewog Development Grant since we have to distribute among the five Chiwogs”. The Gup said their Member of Parliament, The Labor Minister during the election campaign, promised to bring water from Lemichhu. “He said it will be costly to bring water from Lemichhu since it is very far. So now he promised to bring water from Bedilumchhu”. Meanwhile Dagapela residents are questioning for how long will they have to wait to have access to clean drinking water.